Communities see the relationship between broadband, economic development and job creation. What’s not so clear is knowing how to make that happen; the formula will be different for each community. Smart communities are looking into making it happen. To help with the process, Community Broadband Magazine is bringing together experts to talk about how to realize better economic development and job creation by deploying and adopting broadband strategies. The three-day event features national speakers, homegrown experts and local practitioners. Sessions will address the latest, hottest topics – including how to work with local legislators; funding options and financial models; finding the right partners for you; public-private fiber projects; developments in health care, education, energy, etc. ; addressing the needs of vulnerable populations, including seniors, individuals with disabilities, low-income individuals and families and Native Americans; and much more. It’s a chance to meet with colleagues from around the Midwest and Canada. There will be community leaders, IT experts, broadband providers, policymakers and folks from the frontlines, folks who have been successful and folks who have learned the hard way. You can learn from them all, tell your story and find some solutions together. — HUD has released its Notice of Funding Availability (NOFA) for the Youth Homeless Demonstration Program. Up to ten communities, including four rural, will be awarded funds to design and implement a community response focused on ending youth homelessness. $33 million is available for the program. Deadline: 11/30/2016. Click here to review funding guidelines. — The Minnesota J1 Visa Waiver Program will accept applications for FY 2017 beginning September 15 through 4:30 p.m., November 30. Physicians who wish to be considered for a waiver slot must submit their application by the due date. For more information about the J-1 Visa Waiver Program, contact Workforce Grants Administrator Darwin Flores Trujillo at 651-201-3850 or darwin.flores.trujillo@state.mn.us. — LOWE’S Charitable and Education Foundation is accepting applications for Toolbox for Education grants for projects with the potential to have a permanent impact on a K-12 school community, such as facility enhancement or landscaping/clean-up projects. Deadline: 9/26/2016. Click here to review funding guidelines. Proposals must be received by DEED no later than 4:00 pm. on September 30, 2016. Late proposals will not be considered. For more information contact Bob.Isaacson@state.mn.us or 651-259-7458. –The Target Field Trip Grants program provides funds for K-12 field trips in order to give students throughout the country the opportunity to explore more of the world outside the classroom. Grants of up to $700 each will be awarded to educators, teachers, principals, paraprofessionals, and classified staff who are employed by accredited K-12 public, private, or charter schools. Deadline: online applications will be accepted through 10/1/2016. Visit the Target website here to learn more about the program. —Wrigley Company Foundation Community Service Grant provides funding to dental hygienists for projects aimed at improving oral health or providing oral health education. Application Deadline: October 1, 2016. —Service Area Competition Funding for Health Center Program (Areas Served with a Project Period Start Date of April 1, 2017) Funding to provide comprehensive primary healthcare services to an underserved area or population. Application Deadline: Oct 17, 2016. Sponsored by the Bureau of Primary Health Care. — The Mental Health Safety Net Grant program assists mental health centers and clinics that treat the uninsured. Eligible providers must be Community Mental Health Centers or Clinics designated under Minnesota Statute 245.62, or nonprofit Mental Health Clinics designated as Essential Community Providers under Minnesota Statute 62Q.19. Eligible providers must also offer free or reduced-cost mental health care to low-income patients under the age of 21. Applications will be posted on September 12 and are due October 28. For more information, contact Shortage Designation Coordination and Grant Program Manager Keisha Shaw at 651-201-3860 or keisha.shaw@state.mn.us. –The Medical Education and Research Costs (MERC) grant program, administered by the Minnesota Department of Health, distributes grants annually to providers of clinical medical education. The next application cycle is expected to open in late August 2016 and will be due on October 31st. For more information, contact Diane Reger at 651-201-3566. — USDA Rural Development is soliciting applications through the Rural Energy for America Program (REAP), which provides guaranteed loan and grant financing for rural small businesses and agricultural producers to purchase or install renewable energy systems or make energy efficiency improvements. USDA reminds eligible applicants that set-aside funding is available for grant requests less than $20,000 and may offer priority scoring for projects located in underserved areas and/or benefiting underserved populations. USDA also guarantees loans for a minimum of $5,000 and maximum of $25 million. Applicants are encouraged to apply through the loan guarantee program for larger-scale projects. Grant and guaranteed loan combinations are also available. The next application deadline for grants under $20,000 is October 31, 2016. For details on how to apply, visit www.rd.usda.gov/mn, contact USDA Rural Development State Energy Coordinator for Minnesota Ron Omann at ron.omann@mn.usda.gov or (651) 602-7796, or see page 78029 of the December 29 Federal Register. — The Laura Jane Musser Fund is offering funding to encourage collaborative and participatory efforts among citizens in rural communities that will help to strengthen their towns and regions in a number of civic areas including, but not limited to, economic development, business preservation, arts and humanities, public space improvements and education. Programs in Colorado, Hawaii, Michigan, Minnesota and Wyoming may apply. The applicant community must have a population of 10,000 or fewer and must be able to demonstrate the rural characteristics of their location. Deadline: 11/2/2016. Click here to review further guidelines and to apply. —AmeriCorps State and National Grants funding for programs that are designed to strengthen communities and solve local problems, including those found in rural and underserved areas. Funds may be used for programs that utilize AmeriCorps member in the following areas: disaster services, economic opportunity, healthy futures, environmental stewardship, education, and veterans and military families. Letter of Intent (Required): Dec 7, 2016. Application Deadline: Jan 18, 2017. —Grants Aim to Help Increase Number of Hunters and Anglers The Minnesota Department of Natural Resources created the Angler and Hunter Recruitment and Retention Grants Program in 2015 to help local groups support Minnesota’s angling and hunting heritage. — Festival & Event Management Course Offered Online The University of Minnesota Tourism Center will be offering the Festival & Event Management (FEM) online course again in Fall 2016. —Register Today for the 2016 Hospitality Expo Hospitality Minnesota invites you to attend the third-annual Minnesota Hospitality Expo at the Saint Paul RiverCentre on Thursday, Sept. 22. — University of Minnesota to host climate change seminar on Oct. 1st. A seminar titled “Energy from Renewables: Confronting Global Collapse” will be held on Saturday, Oct. 1 at the Electric and Computer Engineering Building (Keller Hall) on the University of Minnesota East Bank campus. The objective of the seminar is to discuss our use of energy and its environmental consequences leading to climate change. Ned Mohan from the University’s Electrical Engineering Department has recruited key leaders on climate action to present at the daylong seminar. Speakers participating are from the University of Minnesota, Stanford University, Caltech, Purdue University, the Minnesota Public Utilities Commission, PluginConnect, WindLogics, Xcel Energy, U.S. Navy, and National Renewable Energy Laboratory. Registration is $25 per person. Registration information is online. Contact Ned Mohan for more information. — The Biomedical Engineering Society’s (BMES) Annual Meeting is coming to Minneapolis this fall from October 5th – 8th. This annual conference features over 2,600 oral and poster presentations highlighting the latest research in the biomedical, and bioengineering fields and 4,000 attendees with diverse backgrounds such as university researchers, professors, industry professionals, and students. –Join the Minnesota Council of Nonprofits for our 2016 Annual Conference on October 6 – 7, 2016 at the Duluth Entertainment Convention Center. Learn more and register. — The Heartland Center for Leadership Development will offer “Helping Small Towns Succeed” October 11-13, 2016, at the Snow King Resort in Jackson Hole, Wyoming. A Regional conference on broadband is a great place to learn what folks in and outside of Minnesota are doing as well as get a chance to showcase what we’re doing right in the Midwest. How to successfully plan for, monetize, and manage an all fiber-based broadband investment. Explore best practices for developing broadband strategies for the knowledge economy. 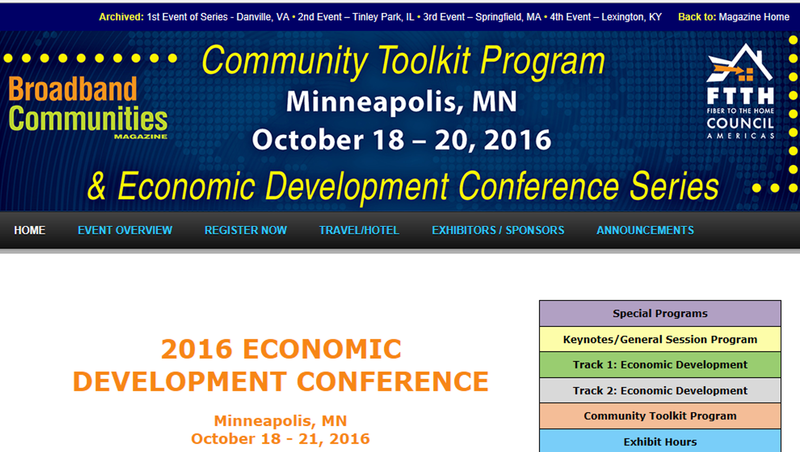 Learn the strategies necessary to foster collaboration with economic development agencies. Differentiate your community with advanced broadband connectivity. Discover how your community can become a magnet for the tech industry. –The annual Many Faces of Community Health Conference will be held November 3-4 in Bloomington. –The Minnesota Solar Energy Industries Association (MnSEIA) recently announced that its 2016 Midwest Gateway to Solar Conference will be held Nov. 15-16 at the Hilton Airport/Mall of America in Bloomington. Information on registration and early bird rate is available. — The 2016 Tekne Awards will be held on November 16th at the Minneapolis Convention Center. You can learn more and find the full list of Tekne recipients at tekneawards.org. Applications and nominations are now open! –Save the Date: Minnesota Campus Compact Annual Summit and Awards Ceremony will be April 5, 2017 at the University of St. Thomas. Who is healthy and who is not? What conditions shape health for all the different populations in Minnesota? What do we have, and what do we need, to assure that all people in Minnesota can enjoy healthy lives and healthy communities? –Nominations for 2016 Community Health Awards. Nominate someone you think deserves a Community Health Award. The awards will be presented by Commissioner of Health Ed Ehlinger on September 28th during the Community Health Conference. For more information, contact Megan Drake-Pereyra at 651-201-3640. –Ron McKinley Philanthropy Fellowship. The 2017 Fellowship application process is open now! Two fellows are being hired for 2017 – 2019 at The Saint Paul Foundation and the Bush Foundation. The fellowship, which was launched as a partnership with MCF and the Bush Foundation in 2013, will prepare individuals from underrepresented communities for careers in philanthropy. Fellows are employed by MCF and placed in full-time positions at host foundations. Over the course of a three-year appointment, fellows receive significant professional development and networking opportunities. Learn more and apply on our website. Applications are due September 28 at noon. — 3RNet Recruiting for Retention Academy Online educational opportunity to learn about tools and resources that can assist you in recruiting qualified providers to your rural and underserved areas. Application Deadline: Oct 4, 2016. —National Health Service Corps (NHSC) Students to Service Loan Repayment Program (S2S LRP) Provides loan repayment assistance to medical students and dental students who agree to provide services in eligible Health Professional Shortage Areas (HPSAs) of greatest need. Application Deadline: Oct 13, 2016. –Nominations for Nurse of the Year. The March of Dimes is honored to pay tribute to the nursing profession by recognizing extraordinary nurses throughout the community. The Nurse of the Year event will be held October 14. For more information, contact Jonathon McCarthy at 612-326-9441. —Country Doctor of the Year Award Award to a physician who best exemplifies the spirit, skill, and dedication of America’s rural medical practitioners. Application Deadline: Oct 15, 2016. — CMS: Medicare and Medicaid Programs; Programs of All-Inclusive Care for the Elderly (PACE) The Centers for Medicare & Medicaid Services is seeking comment by October 17, 2016 on a proposed rule that would revise and update the requirements for the Programs of All-Inclusive Care for the Elderly (PACE), providing more operational flexibility, removing outdated and redundant information, and codifying existing practice. — Culture of Health Prize Awards that honor community efforts and partnerships that are helping people live healthier lives. Letter of Intent (Required): Nov 3, 2016. Application Deadline: Jan 20, 2017. — Rural Impact County Challenge: A National Effort to Combat Rural Child Poverty The Rural Impact County Challenge will recognize and support counties making strides in reducing child poverty in rural communities. The challenge will provide educational opportunities, networking forums, and resources to develop and implement evidenced-based approaches to reduce the number of children and families living in poverty in rural areas. Applications accepted on an ongoing basis. Sponsored by the National Association of Counties. Applications are accepted on an ongoing basis. Sponsored by the Health Resources and Services Administration. — USDA has released a report, “The Comprehensive Property Assessment of the USDA Rural Development Multi-Family Housing Portfolio,” describing the costs to maintain and improve USDA-funded rental housing. Over the next 20 years, properties in the Multi-Family Housing program will need an additional $5.6 billion for capital improvements including roofs, insulation, accessibility improvements, plumbing and electrical and structural repairs. The report also includes a framework for how USDA can collaborate with stakeholders and policymakers to preserve rural rental housing. Get the report here. — The CDFI Fund has released data collected on New Markets Tax Credit (NMTC) investments across the nation through fiscal year (FY) 2014, along with a summary report. Through the first 12 application rounds of the NMTC Program, the CDFI Fund has made 912 awards, allocating a total of $43.5 billion in tax credit authority to Community Development Entities through a competitive application process. View a summary report and the full data release here. — Minnesota ranks among leaders in 2015 Distributed Wind Market Report. Minnesota ranked among the top states in several areas of the recently released 2015 Distributed Wind Market Report. The report provides statistics and analysis of the market along with insights into its trends and characteristics. Minnesota was among the top three states in the nation for small wind deployed in 2015 and for states with most distributed wind capacity deployed since 2003. Read more (pdf). — Bloomberg issues 2016 Minnesota Energy Factsheet. The 2016 Minnesota Energy Factsheet, released in July by Bloomberg New Energy Finance, provides a fact-based overview of Minnesota’s power sector. The report presents key metrics, highlights recent trends, and discusses the state’s progress toward compliance under the EPA’s Clean Power Plan. Read more (pdf). —Explore Minnesota Program Guide Now Available The annual Explore Minnesota Program Guide is a free publication designed to inform Minnesota tourism businesses and organizations about all the ways to get involved with Explore Minnesota programs and promotions. — Two Demographic Trends Contribute to the Concentration of Older Populations in Some Rural Counties Rural counties are more likely to have a higher elderly population than urban counties. This is attributed to the tendency for retirees to relocate to scenic destinations that are often rural, the tendency for young-adults to migrate towards more urban locations, or, in some counties, for both of these tendencies to exist simultaneously. Includes map detailing elderly population by county type based on data from the Atlas of Rural and Small Town America. — Land Acquisition and Transfer in U.S. Agriculture (Amber Waves feature article) In 2015-19, just over 2 percent of land in farms is expected to be sold in an arms-length transaction in which the buyer and seller are not related. Most land that will be sold to nonrelatives in the next 5 years was originally acquired in an arms-length transaction, suggesting that the supply of land available for purchase may not vary much over time. — Mapping Broadband Health in America Mapping tool for visualizing broadband access, demographics, and health data at the national, state, and county levels. Includes a rural filter based on the percent of the population that is rural. —AARPSmall Business Administration Webinars AARP and the U.S. Small Business Administration (SBA) host new webinars and republish previous webinars to educate people who want to start businesses or expand existing ones. –Rural Diabetes Prevention and Management Toolkit This new toolkit, developed by the University of Minnesota Rural Health Research Center, provides resources and best practices to help rural communities develop and implement diabetes prevention and management programs. Access program models and examples, and learn how to implement, evaluate, sustain a diabetes program in your community and disseminate program results. — Health Workforce Mapper Customizable, interactive tool for accessing healthcare workforce-related data at the state, county, or metropolitan area level. Provides information on Health Professional Shortage Areas, hospital locations, population indicators, and patient health data such as morbidity and mortality rates, health behaviors and social environment, healthcare access, and quality data. — Fostering Futures on the Menominee Indian Reservation The Menominee Tribe in Wisconsin has been deeply affected by trauma for years. A state-wide initiative called Fostering Futures has initiated trainings for clinic and school staff to administer trauma-informed care and build resilience among children. — HHS Report Outlines Problems, Potential of Telemedicine The U.S. Department of Health and Human Services released a report detailing both the struggles with and the potential of telemedicine. Problems cited include costs, licensing, broadband connectivity, and differing policies between facilities, but the report also explored the great capacity of telemedicine to expand and redefine medical services, potentially providing life-altering access to care for underserved populations, including those in rural areas. — Report to Congress: E-health and Telemedicine Report regarding the current state of e-health and telemedicine after the implementation of the Affordable Care Act (ACA). Includes current policy challenges, discussion of federal level telehealth activity, and a legislative proposal for the Fiscal Year 2017 budget. — Rural Hospitals in Critical Condition Explores the shortage of healthcare professionals in rural communities, both in Wisconsin and throughout the U.S., and the expectation that this shortage will increase over time as need grows and new health professionals continue to be drawn to urban locations. Also discusses efforts that have been made at the federal level to address the concerns facing rural facilities and the successes of telehealth in meeting rural health needs. This story is the second part of a two-part series; the first part was published on August 11, 2016. —Minnesota Hospital Association Mental and Behavioral Health Data Collection Pilot: Reasons for Delays in Hospital Discharges of Behavioral Health Patients Results from the first-of-its-kind pilot study to better understand how often and why Minnesotans are unable to access mental health care in the most appropriate settings. Completed by Wilder Research, Minnesota Hospital Association, August 2016. — Life Lessons from a Small-town Undertaker as White Women Die Younger in America Follows an undertaker through the death of two white women, aged 44 and 59, in rural Kentucky. In McCreary County, Kentucky, there has been a 75% increase over the last 15 years in the mortality rate for white women aged 35 to 59. To compare, national death rates for white women of similar ages have increased only 23%, for white men they have increased 16%, and have decreased for both black and Hispanic men and women. This is the fifth installment of a multi-part series: part one, part two, part three, and part four. —Federal Interagency Health Equity Team Compendium of Publicly Available Datasets and Other Data-Related Resources Identifies and describes publicly available data that could be used by projects working to reduce health disparities. Includes datasets and data-related resources from agencies within the U.S. Department of Health and Human Services, as well as from the U.S. Census Bureau and U.S. Department of Commerce. The Minnesota River Valley National Scenic Byway is requesting proposals for a Dakota Content Specialist to fulfill requirements of a grant from the Minnesota Historical Society.